We have a playgroup of about 14 kiddos that have gotten together on a semi-regular basis since they were 4 months old. When your 2 year old has 14 or more best buddies, that means you have 14 birthday parties to go to in a year and 14 gifts to give without breaking the bank. For the most part, everyone in the playgroup requests a "No Gifts Policy" but I don't really like to show up empty-handed, so here are a few ideas of gifts you can give a big group that cost very little if nothing at all! This year, I gave everyone turning 2 a personalized crayon box. Print out the child's name using Curlz font, or any other that tickles your fancy. 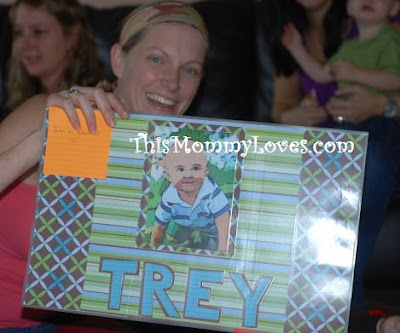 Cut out the name and tape it to the inside of the crayon box so you can trace it on the outside. Once tracing is complete, remove the paper on the inside of the box. This is prettier than I could ever write on my own. Stuff in your crayons and stickers and there you go, a cute personalized gift that cost barely a buck each. 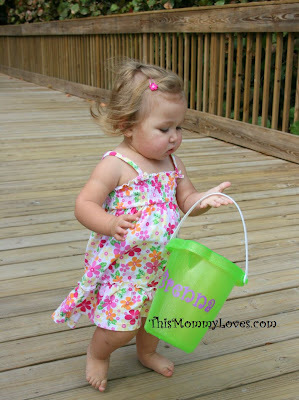 I stole the concept from one of my Mommy Squaders, Kendall, who gave these adorable personalized beach buckets to everyone in the playgroup last year. How cute?!?! Another one of my Mommy Squaders, Lauren, gave everyone a coloring book. So simple, cheap, and age-appropriate! Also a great gift is a personalized placemat. This only cost $3.00! Tutorial Here. Head to the Dollar Store or Walmart and with a little creativity, you can get everyone a small gift for very little money. These ideas could also be used for party favors. 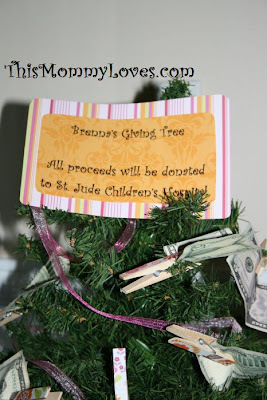 Of course if you are feeling philanthropic, a wonderful idea if you are hosting a party is to have a Giving Tree and in leui of gifts, ask that everyone just bring a buck or 2 to hang on the tree. What are some of your favorite inexpensive gifts for little ones? Thanks for the love, bloggers! Especially those who have featured this post! Love it! Tracing the name like that looks very professional! Oooooh! I can't wait to hear how to make the placemats! I want to make them for all of my friend's puppies for Christmas gifts! Thanks for all of the great ideas, Jenn! So adorable! Can't wait to see how to create the placemat! What a terrific idea! Thanks for stopping by and sharing your project with us at Anything Related! A great idea --so very cute! Thanks for stopping by my blog and for the link! Great idea! Tracing the name is such a simple, but stylish, idea!